BEWARE! Wolfthorn deodorant is a real thing and it’s probably lurking in a 24 hour pharmacy near you. My grandfather had a lifelong love of hardware stores. For my parent’s Silver Anniversary, he bought them a whole bag full of things from the local store; silver nails, a silver hammer, a screw driver. I think there may have even been some saw blades in there too. He was a curious ol’ chap. Me? I seem to have spent a lot of time over the past few years in drug stores, wandering the aisles waiting for this or that prescription to be ready. You know you’re a regular when one of the bald pharmacists jokes with you about hair care products and you buy bagels for another who offhandedly commented that she hadn’t eaten breakfast. It was during one of my meanderings (or Spiritual Wanderings, if you will) that I came across the most unusual thing in the deodorant section. 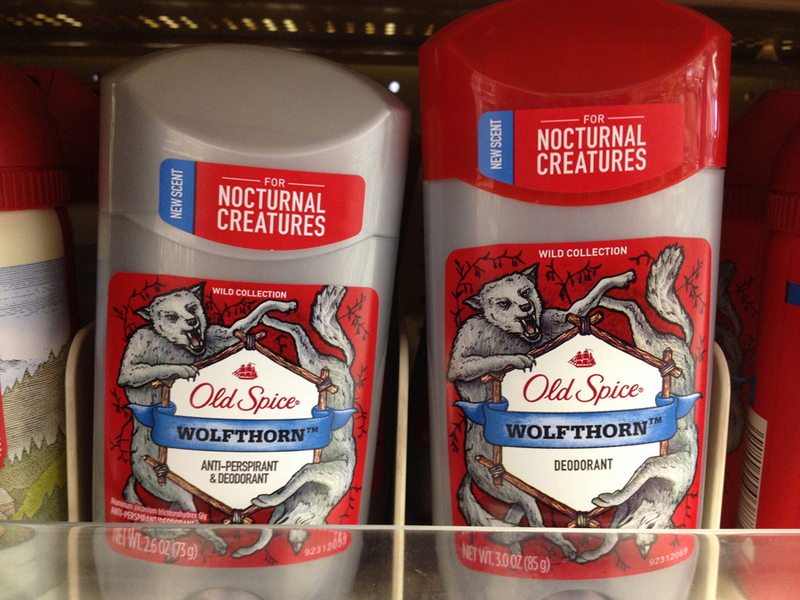 Old Spice has a new scent called Wolfthorn, but it’s only for Nocturnal Creatures. I thought it was a Photoshop joke at first, then my quick-acting brain reminded me that Photoshop layers don’t apply in real life … yet! Then I was sure someone was just having fun or being silly at my local Walgreens. But upon further examination, the darn things are real. If you don’t believe me, here’s a YouTube video with three million hits. Getting creative with advertising is one thing. Creating an entirely new product to support that ad is a whole other thing. But which came first the chicken, I mean, the wolf or the thorn? I did a little digging around and found out the above ad ran during the Super Bowl. Metaphorically scratching my head, I simply couldn’t remember such a commercial. I’m pretty good at keeping track of Super Bowl ads; maybe it ran during the power failure. Nope, it ran alright, in exactly one city, one time. I guess to help stretch their advertising dollars, according to Adweek it only ran in Juneau, Alaska. I’m told the commercial has hit the national airwaves off and on ever since. I guess I just never bumped into it while watching Mad Men or Wolf Blitzer. The ads come out of the creative Portland, Oregon agency of Wieden + Kennedy. I don’t know where the actual Old Spice is made though, probably in some … wait for it … sweat shop somewhere. Recently, I called my wife back from the Costco brink and begged her to watch a funny commercial involving a surgeon who is followed all day and night by his shower and a bar of soap. It turns out it’s Old Spice soap and the commercial is by those zany Oregonians. I wonder if I missed my calling. If companies can convince their boards of directors and share holders to go out on a flimsy limb and make weird products and commercials just because they’re funny, there’s hope for America yet. I want in on the fun too. Now I just have to figure out who does Costco’s TV ads and get a job with them. I can save my marriage and maybe pick up a metric ton of toilet paper in the process. Oh wait, Google tells me Costco doesn’t advertise on television … or anywhere. (EDITOR’S NOTE: Rodney has been rubbing Old Spice and only Old Spice under his arms since the late 80s. I gave up deodorant ages ago and have never “stunk” since. Mind you, I am OLD. Maybe my sweat glands have atrophied. But I want to smell this stuff. Who the f*** are these nocturnal critters anyway? Raccoons? Foxes? Coyotes? I gotta get me to a Costco – altho the nearest one is 2 1/2 hours away and involves a $45 (Cdn) bridge toll. there Olivia. now you have no excuse.